I wish to acknowledge the delivery of the car do me in very good condition today 31 May 2012. I want to thank you for your cooperation and look forward to doing business with you in future. I will also not hesitate to recommend your company to my colleagues at the African Union. How are you going? I hope you are well. It is a holiday in the Solomon Islands today so I thought that I would get a photo of our Subaru Legacy that we purchased through you. Very happy with the car and it handles the rough roads here in Honiara with ease. I will send a better photo when I can. Received the vehicle. Thanks for service level. DHS Terios 1998, my wife and 2 daughters enjoy driving with automative gear provide smooth and silence power, its a very nice car, thank you for trust company,a very excellant company,give us joy n good life,i like to do bussiness with you at the future. Yoko,I have now pick up the vehicle and its with safe hands. Thank you it is a nice car for young couples. I now can visit my family instead of catching a public transport to point A to point B. Once again, thank you TCL for being providing freindly sevices to a person whos long distance made it the best services in Japan. i received my beautiful Cold in excellent condition.it was great doing business with you and now i can safely call you TRUST company! Am looking forward to buying my next car from you. Thank you so much for your great assistance in helping me purchasing my car. I have received the car in very good condition and I am very happy. Thank you very much for the 3 vehicles we received safely today, we will be ordering some more vehicles from your end shortly. Its good to do business with you. Please be informed that I have received my car and in good condition I really did appreciate you support . Please guys do support others the way you showed patience on me. Just wanted to say thanks, i received my car in good condition as ordered. another or even advise my friends to buy from your company. have sent to me and on the website. Trust Company, To your great team, also one of your sales rep Mr Juan Martel Congratulations for the quality of your services and the quality of the car I bought from you. Thank you very much for doing business with you….i just recived the vehicle (toyota vista) today at 4:00pm. Trusting you & your trust company and looking forward to doing business with you in the near future. Thank you so much for shipping the Vehicle. It arrived in a very immaculate condition this evening. My Special thanks to Victor Shakwe inTanzania for his dedicated and personalized service. I will Recommend the Good service from Trust Japanese Vehicles to a friend. I received the car already and it nice asnd satisfied with it. I write to confirm that I have now received the vehicle from Dar es Salam port. May I thank you very much for your assistance. My wife now has the Toyota Vitz with CD player and automatic door closing. Thanks to the management for enabling us to buy the vehicle from Japan and reach Malawi safely. The only problem faced was that Malawi want vehicle from year 2003 to date. So I had to pay more duty. All the same I have liked the vehicle and more friends want to order in June/July 2012. I will contact you when time comes for them to purchase. Once again thanks and God bless you all. Keep in touch. I have received my vehicle and I look forward to order another one sometime later. customers to be unhappy in anyway. 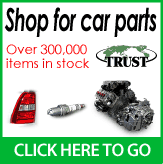 ""TRUST COMPANY"" as the name implies YOU ARE STILL THE BEST, RELIABLE & RESPONSIVE & I`m coming back for more + will do your campaign at my end to individual buyers whishing to import vehicles from Overseas. Thank you one & all!!! good and all what I can say is that keep up with this spirit am really impressed. driving it safely in Dar es Salaam.